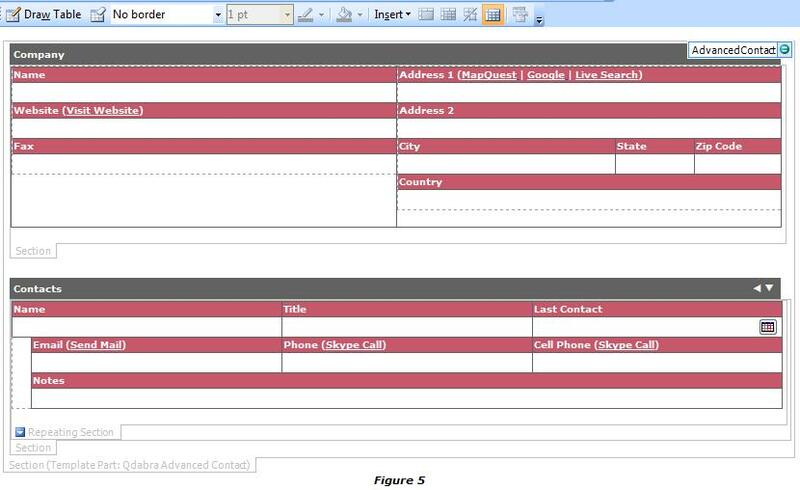 The Contact Block Advanced Template Part contains a section for Company information, and a repeating section for Contacts information. This is especially useful if you want to keep a record of contact persons / employees for every company, all in one place. The Contact Block Advanced Template Part is part of the Qdabra Template Parts package ($25). See all of the template parts included in this package and purchase it here. This template part is designed to speed up customer lookup using Smart Links. Skype Call – opens Skype to call up the numbers entered in the Phone and the CellPhone fields. 1. In InfoPath Design mode, click Controls in the task pane, and scroll down to the Custom section found at the very bottom of the task pane. 2. If you haven’t installed any custom controls (like template parts), you will see that the Custom section is empty. Click Add or Remove Custom Controls, and then click Add in the dialog box that appears. 3. 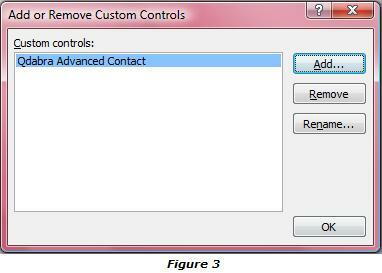 In the Add Custom Control Wizard, select Template Part from the options and click Next. 4. Browse to the path of your template part, and click Finish then Close when done. 5. The template part will now show in the list of your installed template parts. Click OK to close the dialog box. 6. After successful installation, the template part will now be available in the Custom section of the Controls task pane (Figure 4). 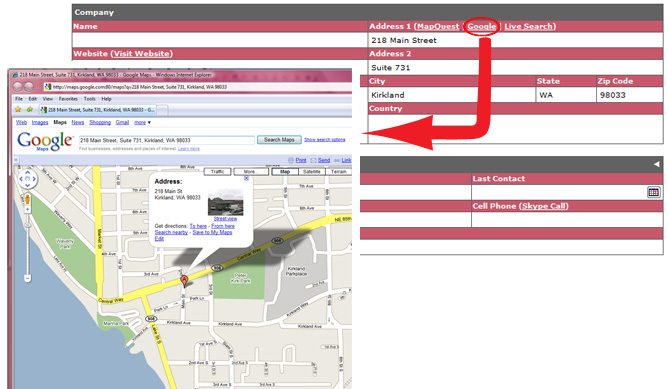 To use it in your form, just click the template part and it will be shown on InfoPath’s design area (Figure 5). You can then continue designing your form and edit the sections in the template part as necessary. If you have added a template part to InfoPath as a custom control, modifying the template part will not change the control. You have to uninstall the current version from your custom controls in InfoPath (using Add or Remove Custom Controls) and then add your new version. In a real working environment, you must send the updated template part to anyone who is using the original. After the updated template part is installed on each computer, the users are notified that an update is available, thus the need to update the existing forms that are using the template part.